Young as he is, our son announced that he'd like to learn tennis this Summer. It was a surprise to me as I had been pricking his interest in the game for a couple of years now but for some reason he's had this easily reluctant response to suggestions. We'll see how he does. Having played games before, I am an avid fan and have been following the sport from one grandslam or even ATP championship match to the next. 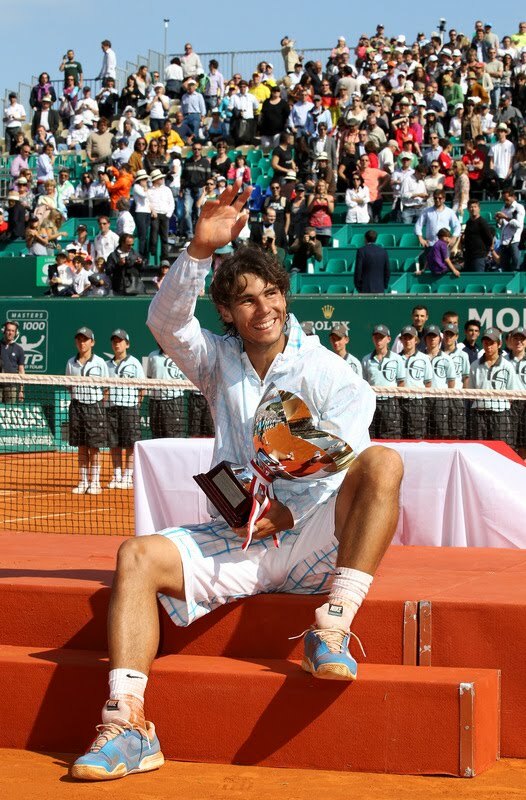 Rafael Nadal whose photo graces this post slid from the premiere position to the world's number three due to a series of injuries last year until early this year. Despite that and considered by many as Federer's nemesis and heir apparent, his appeal to fans worldwide didn't wane including marriage proposals from women in the stands and courageous streaks across the court by gay men for a quick hug. 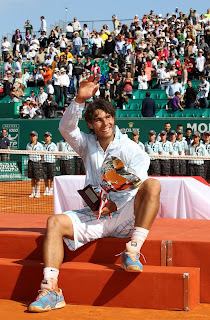 He's just won the Monte Carlo title (see photo) this year. Previous icons like Sampras and Agassi have been intermittently coming out of retirement to play a game or two. Justine Henin came back to the game after some hiatus. I guess it's just too difficult leaving the limelight or is it just the sound of the racket hitting the ball. What does one feel as match point nears and then goes. It's just like life, isn't it? The thrill is long before match point, no matter what all may argue about finishing the exhausting five or six-set game -- that's when you judge how great a game was fought and went. As much as we'd like our idols to clinch victory at match point, we relish the brilliance of the game with every forehand/backhand/serve/topspin/volley. This is what generates applause and ahhhhs. When we live life like a tennis match, we savor every minute of it believing that match point will eventually arrive. Let's play. @citibuoy Would you be if we requested Rafa to teach you some strokes? Great to hear from you.